VMware vCenter Converter Standalone 5.0 is a FREE tool available from VMware upon registration, the purpose of this software tool is to easily convert physical or virtual computers, images of computers to VMware virtual machines. Server and Workstation operating systems are supported in the conversion. 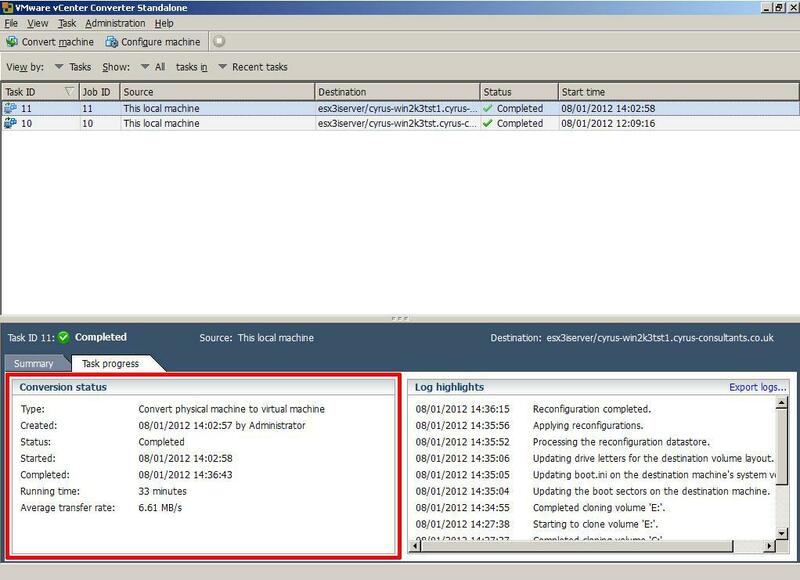 In September 2011, VMware released version 5.0 of VMware vCenter Converter Standalone 5.0, with many new features including partition alignment important for aligning partitions correctly on storage array networks (SAN). 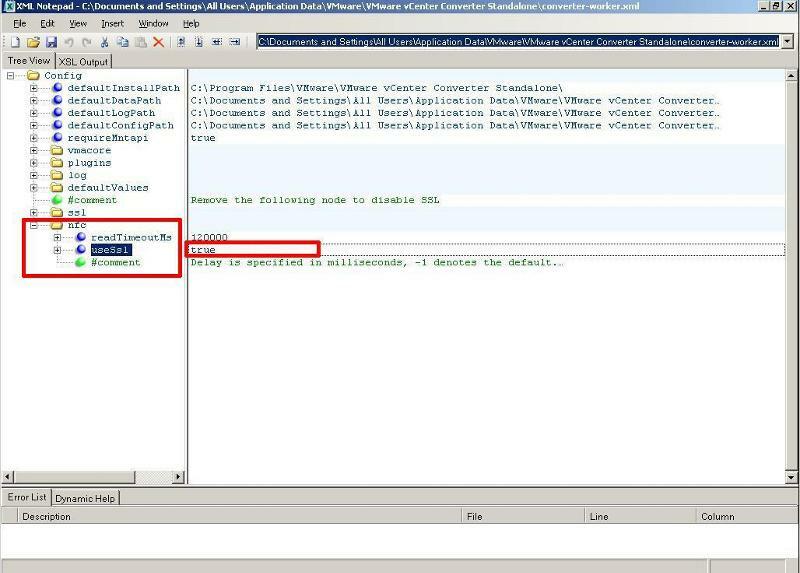 BUT, we've noticed that completing conversions using VMware vCenter Converter Standalone 5.0 compared to using VMware vCenter Converter Standalone 4.3, were taking much longer, and the transfer rate of a conversion had become degraded when using version 5.0. The following modification will improve the transfer rate when using VMware vCenter Converter Standalone 5.0, to similar transfer rates obtained when using VMware vCenter Converter Standalone 4.3 to perform conversions. 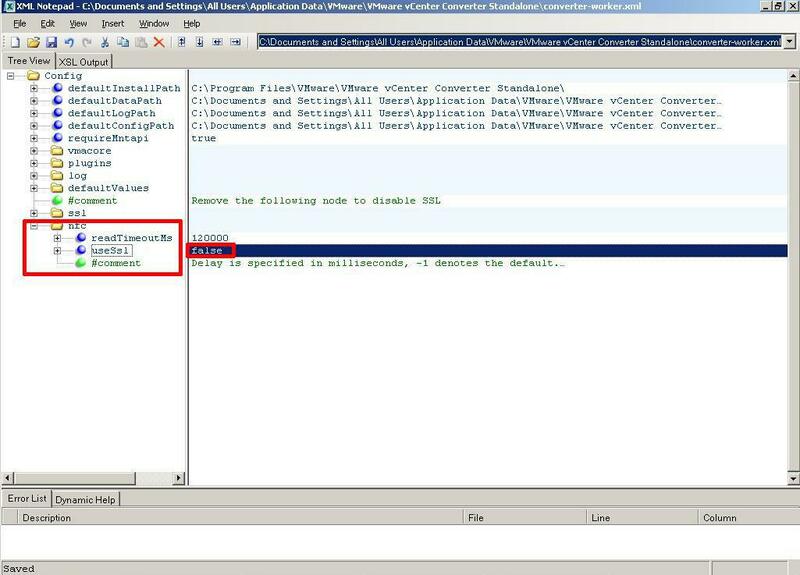 It would appear that VMware uses a proprietary VMware protocol called NFC, to image to destination, also by encrypting (SSL) the data payload transfers in version 5.0, this additional overhead causes transfer performance degradation. The result of which is a longer than expected conversion time, when compared to version 4.3. Turning OFF SSL Encryption in VMware vCenter Converter Standalone 5.0 can improve transfer rates. You may find it easier to alter/edit the file using Microsoft XML Notepad 2007 to edit the XML file. But Notepad or Wordpad can edit the file, just ensure, you make a copy of the original file for backup before making any alterations. Using XMP Notepad 2007, you do not have to scroll the contents of the file, and the <useSsl> section is quicker to find and edit, but whatever tool you find most comfortable to use to edit the file, is okay. 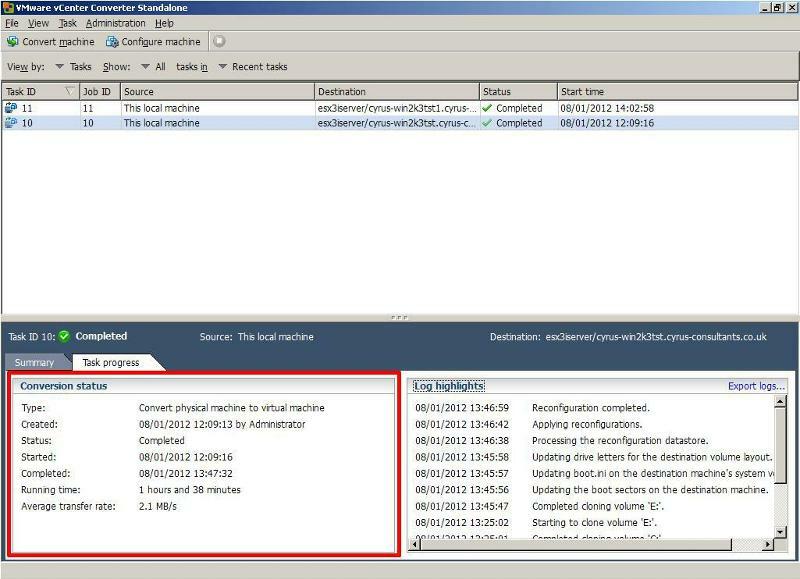 For changes to take effect - Restart "VMware vCenter Converter Standalone Worker" service. We have seen performance increases from at least 2x to 6x. So if you want to half the conversion time at least, then alter the encryption setting. If appropriate for your environment. In the following example, a Windows 2003 Server was converted from Virtual Machine to Virtual Machine (V2V) using VMware vCenter Converter Standalone 5.0 installed on the server to be converted. In the first conversion (TaskId10) the SSL Key was left as the default TRUE, and encryption was used. In the second conversion (TaskId11), the SSL Key was set to false. As can be seen from the following screenshots Average Transfer rate has increased from 2 MB/s to 6 MB/s and the conversion time has reduced from 1hr 38mins to 33mins..
A performance increase of 60%! just by chaning a value from true to false.